“Paraíso Escondido” means “hidden paradise”. It is title of an exhibition of paintings, silkscreen prints and ceramic works of Ingrid Simons in Galeria Municipal Dom Dinis, in Estremoz, Portugal (17 june - 27 august 2017). In this exhibition, showing paintings, silkscreen prints and ceramic works, special focus is given to her interpretations of the “Hidden Paradise”, an open space in a dense woodland with a creek and intriguing rocks. There, Ingrid Simons experienced the cycle of life: the strong greens of spring turning into the golden colors of hot midsummer. She felt sublimity and strength of nature emphasizing the nullity of man. In 2010 Ingrid Simons had her first artistic residency at Foundation OBRAS (Evoramonte, Portugal). She fell in love with Alentejo at first sight. This grew into a strong and lasting love. In 2017 she returns for the 8th time. First she mainly made paintings inspired by the Alentejano landscapes. Later she started making ceramic works following Alentejano tradition (for which she established a collaboration with the master potters of Redondo: Xico Tarefa and Luìs Carlos). Especially 2015 was a busy residency. She got two exhibitions and was the focal point of several other activities. 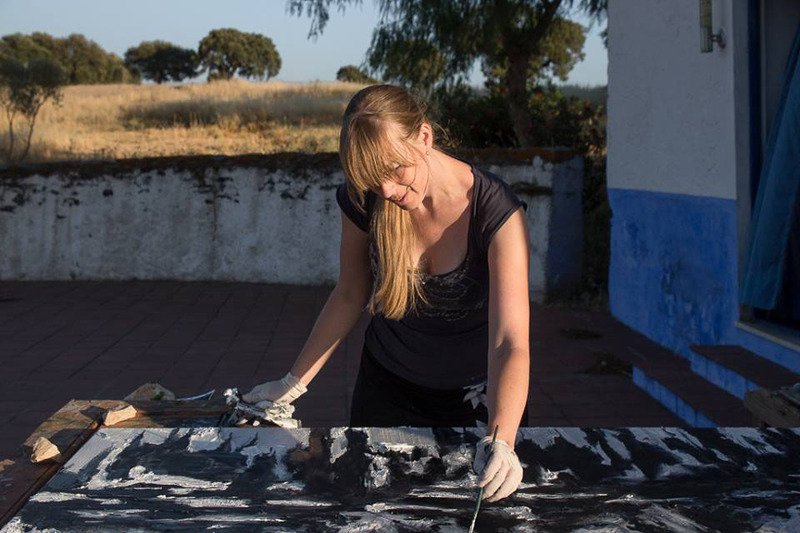 She returns partly for making paintings in sizes that she cannot make at home and partly because she fell in love with Portugal: with the culture, the landscape, the light and the people. This love-affair affected her use of colors, her subjects and her artistic mediums. Besides painting and silkscreen printing the explored ceramics, video and, most recently, installations. O azul do Alentejo sob o meu olhar is the title of her exhibition in the Museu do Artesanato e do Design, in Évora ( 28 May - 26 July 2015). See the slide show on this page for an impression. Ingrid shows ceramic works that was created as part of a project in which she studied the Portuguese Azulejos and the Dutch Delfs Blauw. She investigated what those two ceramic traditions could mean for contemporary art. Raios de Luz is an exhibition in the municipal museum of Estremoz with paintings and silk screens (3-22 June 2015). It showed a selection of works that Ingrid made in the past five residencies. The slide show gives an impression. The catalog of this exhibition is available via OBRAS. It shows some for her works and also contains several beautiful, partly poetic reflections on her work by Portuguese artist-friends and other art-lovers and connoisseurs of her work. At the opening José Rodriguez dos Santos gave an impressive speech in which he explained how artists like Ingrid change the peoples´ perception of the landscape. His paper will soon be published. A spin off of this exhibition is also a short documentary: INGRID, produced by GMT (Luís Branco and others). Apart from being a poetic visual portrait of Ingrid, it highlights her struggle with one particular painting. It will soon be online. Also on this page are a slide show and a youtube video on her previous residencies and Portuguese exhibitions. Together with another artist-in-residence: Kimberley Trowbridge (USA) she renewed her artist statement. The full statement is on the website of Ingrid Simons. A short version is given her. I am interested in deconstructing the landscape and reconstructing a new, physical, raw, reality of my personal experience. This process is my contribution to the historical narrative of landscape painting. It is important to me to continue this narrative, because I believe in the potential to understand our human nature through the investigation of our relationship with our environment. I do this through painting. Painting is my vocabulary. I am creating a new interpretation/experience for the viewer because it is filtered through my consciousness. My experience of making the painting is physical, the rapidity of creating a painting is essential, the directing. Process: I sketch in charcoal a simple linear architecture, then I use turpentine to dissolve that architecture and then much of the process of the painting is a search to find my way out of that dissolution, ultimately to let go of that original architecture or landscape reference of a specific place, into a new space that only exists through the process of painting. Photos/observed nature (references), or even the singular addition of a horizon line as the starting place, is how I situate my body in space in relationship to the canvas, to create an illusionistic space. By sculpting with the paint in a very visceral manner (physical) I am inaugurating/ creating a new experiential, expressive space. These “landscapes” do not exist in nature or photographs, they are not references to the landscape, they ARE expressive objects/spaces that only exist through the physical act of painting them. Ingrid Simons graduated at the AKV (1999; ’s-Hertogenbosch NL). Her work is presented by three galleries across the Netherlands. She had solo and group exhibitions at museums, galleries and art fairs in The Netherlands, Germany, Belgium, Italy, U.S.A, Russia and five times in Portugal. Twice she was on the shortlist for the Royal Award for Modern Painting and in 2016 she was awarded the Stipendium Established Artist by the Mondriaanfonds. Essays on her work have been published in Dutch, German, English, Italian and Portuguese. Ingrid Simons in de Salon : over Nederland, Portugal en Azulejos (2015). Libraryblog, Vrienden van het Van Abbemuseum, Eindhoven,Piet van Bragt. Landschappen van de ziel; De kunstenaar en de natuur van zijn jeugd. MEST Magazine nr 9, Anneke van Wolfswinkel. Só os caminhos eram meus (2013). A visual overview of Portuguese works of Ingrid Simons and letters to her, written by art critics and friends (in Portuguese and Dutch). Shadows shift (2010 & 2011). With texts by Florent Bex (Honorary Director of the Antwerp Museum of Contemporary Art) and Alex de Vries (art critic). Crossroads (2005). With texts by Alex de Vries en Jan Doms (in Dutch, German and English).